Hathaway Brown School is located on a 16-acre campus in Shaker Heights, Ohio. Athletics facilities onsite include an Aquatic Center, gymnasium, tennis courts and field hockey, lacrosse and softball fields. 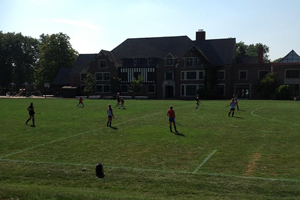 Our soccer teams host games at nearby Ursuline College. HB is easily accessible from throughout Northeast Ohio. Click here for detailed driving directions. At HB, outstanding athletic performances are enhanced by top-of-the-line athletics facilities. Students utilize these spaces to integrate physical activity into their lives. HB is proud to be one of the few girls' schools in the country with its own aquatic center, the Carol and John Butler Aquatic Center, dedicated in 2005. Designed by Graham Gund, the Center is home to the Blazer swimming and diving teams. The pool has eight lanes, a diving well and a three-foot deep instructional area. The electronic scoring and timing system is provided by Daktronics, and the pool grandstand seats 150 people. Two locker rooms and pool offices are also included in the aquatic center. Dedicated and refurbished in 2004, the Corrigan-Daniels Athletic Center (HBS Gymnasium) is home to several facilities. The gymnasium, built in 1981, is home to the Blazer basketball and volleyball teams, and is also used for many physical education classes and the adventure-learning course. 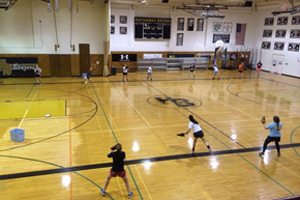 The gymnasium floor is all hardwood, and it is also lined for badminton. Attached to the gymnasium are three sets of locker rooms, offices that house athletic administration, coaches and physical education staff and a training room equipped with an ice machine, treatment area and a whirlpool. Also part of this facility is the Hathaway Brown School Athletic Hall of Fame, which displays accomplishments of each of the athletic teams. The athletic center is located on the east side of the campus. Dedicated in 2002, the air-conditioned Corrigan-Daniels Fitness Room is furnished with weight training equipment. The equipment consists of both free weights and Body Masters exercise machines, as well as treadmills and elliptical machines. The Fitness Room is located on the upper level of the gymnasium lobby. Dedicated in 1999, the Martine Vilas Conway Tennis Courts at Hathaway Brown School are home to the Blazer tennis teams. There are six regulation size courts, and each is topped with an all-weather, Novacrylic surface. They are located just west of Sherbrooke Drive. Built in 2016, Wolf Field is home to the Blazer field hockey and lacrosse teams and is used for several physical education activities. It is a turf field, and it is located on the Hathaway Brown School campus just south of the main school building. Built in 1988, the HBS Middle School Field, which is located south of HBS Wolf Field, is home to our Middle School teams throughout the year. Dedicated in 2002, the softball field at Ursuline College is home to the Hathaway Brown School softball teams. The field has an all dirt infield that is primarily made up of a Pro-Turf mixture. A six-foot high fence encloses the natural grass outfield. Dedicated in 2001, the soccer field at Ursuline College is the home to the Blazer soccer team. The college-sized playing field is natural grass. 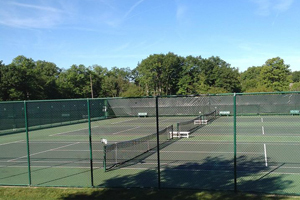 Dedicated in 2004, the tennis courts at Ursuline College are home to the Hathaway Brown School tennis teams. The six-court complex is topped with an all-weather Novacrylic surface. The courts are located about 10 minutes from the campus of Hathaway Brown School.